The most recent Park Break sessions were held in March 2012 at Delaware Water Gap National Recreation Area, and in October 2012 at three Boston area national park units. At DWGNRA, the topic was the creation of a curriculum on sustainable living to be used at the Pocono Environmental Education Center (PEEC). National parks, such as DWGNRA, are often at the center of the resource use equation when examining sustainable living issues. Food, water, energy and shelter requirements intersect and often conflict with land conservation priorities. Today, DWGNRA and the Delaware River confront new challenges from Marcellus Shale drilling to the north (which has the potential to affect water quality), new transmission lines which may bisect the park, as well as the encroachment of the New York and New Jersey suburban housing sprawl at the fringes of the park. The Park Break Group Project Topic was to create a curriculum on sustainable living that will target 8th-graders and focus on the resource choices and tradeoffs we need to make as a society. In keeping with PEEC’s interactive approach to teaching in a national park, the curriculum needed to consist of meaningful hands-on activities that reinforce the lessons of sustainability strategies and lifestyle compromises necessary to maintain the planet for the next generation. The Park Break team was responsible for creating the content for two 1½-hour classes to be taught at PEEC by our environmental education instructors. They included background information, Q&A dialogue prompts for instructors, a selection of four hands-on activity related student projects/ tasks to be completed by students during a class, as well as follow-on activities to be complete by students and their teachers back at school. 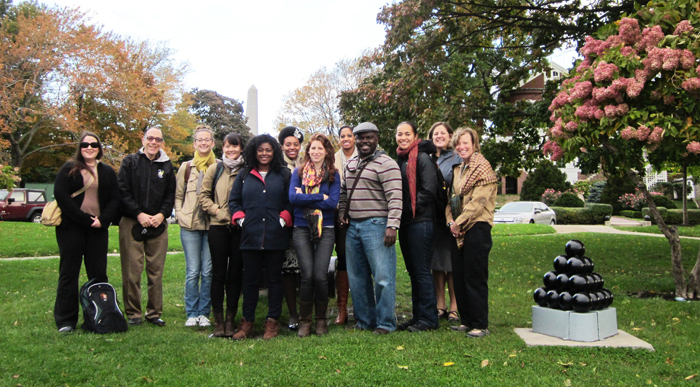 The week of October 15, 2012, found Park Break in Boston studying cultural resource management in an urban setting. It was a ground-breaking session, devoted solely to issues challenging managers of historic sites and related places, especially with regard to diversity in NPS working ranks and the people who visit these areas. Three local parks were the focus of the week’s work: Boston African American National Historic Site, Boston National Historical Park, and Lowell National Historical Park. Engagement centered on the topics of making NPS sites more relevant to diverse communities and ways to attract diverse audiences to national park sites. All aspects of cultural resource management were involved – museum services, building preservation, interpretation, cultural landscapes, planning, compliance, and preservation outreach to communities and partners. Topics included the evolution of how historic parks and sites are chosen for designation and today’s emphasis on selecting sites that better reflect the diversity of our shared heritage, making collections and exhibitry more relevant to diverse audiences, and partnering with diverse community groups to increase our capacity in telling America’s story.